Eating fresh seafood has many health benefits. It’s a low-fat source of protein and is packed with vitamins, minerals, and antioxidants. Along with these benefits comes a risk: mercury. While there is no shortage of research on the topic of mercury in seafood, data from national and international sources does not account for regional variances in results. We tell our customers to turn to local resources for the most accurate information. We recommend you visit The North Carolina Department of Health and Human Services to learn more about fish consumption advisories and mercury in fish. A resource that we often share with customers is the NC Division of Public Health’s Safe Fish Guide, which outlines recommended serving sizes per species. For more detailed information, turn to NC Sea Grant’s study of mercury found in North Carolina fish. Sea Grant collaborated with scientists from Duke and North Carolina State to determine mercury and PCB content in several popular inshore and offshore species. 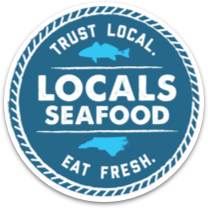 Here is a link to their document on Purchasing Seafood that provides NC specific data and recommendations. On average, the larger the fish, the more heavy metals and PCBs have accumulated in the fish. Locals Seafood buys smaller fish than many seafood distributors, reducing your risk of consuming high levels of mercury from our product. At the end of the day, the decision on how much and how often you eat seafood is up to you. Reading research and information from trusted sources allows you to make an informed decision. As it pertains to recommendations for certain populations, it really is up to every individual. Many women of childbearing age are not pregnant or even trying, and that can influence their purchasing decisions. Our staff is happy to answer any questions you have about mercury in seafood.